In this article, you'll learn how to build a very basic kitchen pantry cabinet. Other than size, there is little difference between this and a basic wall cabinet, and if you have rudimentary cabinet-building skills you can easily complete this project. 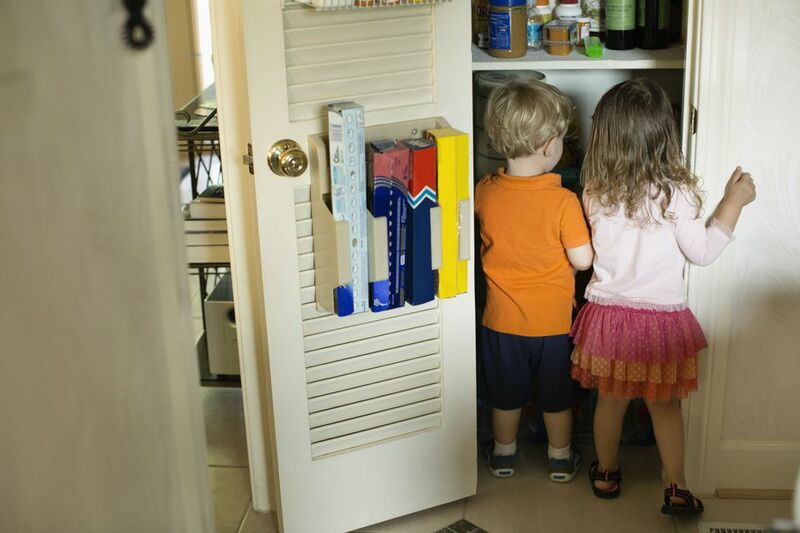 Like many other basic cabinets, a pantry cabinet is nothing more than a plywood box with shelves that is fastened to the wall to prevent it from moving. The cabinet can accommodate a number of shelves that can be placed at the desired heights to allow for storage of small items; or the shelves can be eliminated from the design altogether if you want the cabinet to serve as a broom closet or to house a vacuum cleaner. Once finished and installed, you may wish to build and install some cabinet doors to match the look of the rest of the kitchen. As presented here, this basic pantry cabinet will measure 84 inches high, 12 inches deep, and 12 inches wide, and it will have five shelves with a reinforcing divider between the upper and lower sections of the pantry. The entire unit at these dimensions can be built from a single sheet of 3/4-inch sanded cabinet plywood, along with some screen molding for covering the exposed edges of the plywood shelves. The design could easily be adjusted to build a pantry cabinet of a different size, but you'll need to adjust to the quantities of materials. To get started, raise the arbor on your table saw with a plywood blade installed so that the blade is about 1 inch above the saw table. Position the fence so that the face of the fence is 13 inches from the nearest edge of the saw blade and lock the fence into place. Lay a 4 x 8 sheet of 3/4-inch plywood flat onto the table with one of the long edges flush against the fence. Turn on the saw and rip a 13-inch wide section, 8 feet in length, from the plywood sheet. Set the strip aside and rip a second 13-inch wide piece from the sheet. Set the remaining strip aside. Adjust the saw fence to 11 1/4 inches from the blade, and cut an 11 1/4 x 13-inch section from the end of each of the two strips. Then, trim each of the two long strips to 84 inches to serve as the sides of the pantry. Cut a 3-inch deep by 4-inch tall notch out of one corner of each of the plywood strips, using a circular saw or jig saw, to accommodate a toe kick. Set these two cabinet sides aside for the moment. Now, you will cut the rabbet grooves in the back inside edges of both side panels, where the top panel and back panel will fit. Install the stacked dado blade into your table saw, adjusted to a thickness of 3/4 inch, and adjust the blade height to 3/8 inch above the table. Attach a sacrificial strip of wood against the saw's fence with a pair of clamps, then adjust the position of the fence so that the edge of the sacrificial strip is flush with the side of the saw blade without impeding the motion of the blade. Position one of the long cabinet sides with the inner face down on the bed of the saw and the top edge (opposite the edge with the toe kick notch) against the sacrificial strip. Cut a 3/4-inch wide, 3/8-inch deep rabbet into the top of the cabinet side. Repeat with the inner edge of the opposite side panel before removing the sacrificial strip from the fence. Adjust the fence to 12 3/4 inches from the edge of the dado blade, and cut a rabbet along the inner face of the back edge of each of the two cabinet sides to accommodate the back panel. Cut this same rabbet along the back edge of cabinet top and bottom as well. Adjust the fence to 4 inches from the edge of the blade, and cut a dado into the lower section of each side panel, along the inner face to accommodate the bottom shelf. The edge of the dado should align with the top edge of the toe kick notch. Move the fence to 16 inches from the dado blade, and rip a dado in each inner face of the two sides. This is where the lowest shelf will fit. Move the fence out another 12 inches (to 28 inches from the blade), and cut another dado in the inner face of each side panel. Continue cutting dadoes for each shelf at 12-inch intervals until you have completed a total of 5 shelf dadoes, not counting the bottom shelf dado or top rabbet. With all of the dadoes cut, it is time to begin assembling the pantry. Place one of the cabinet sides with the dadoes facing upwards onto a work surface. Place a bead of glue into the bottom dado, and smooth out the glue with a small brush so that the entire dado is evenly coated with glue. Position the cabinet bottom into the dado with the rabbeted edge in the back facing center of the cabinet. Position your combination square against the cabinet side and the cabinet bottom to ensure that the joint is square. Use a finish nailer and 1 1/4-inch finish nails to toenail the cabinet bottom into place. Hold the nailer at an angle of about 20 degrees, and drive the nails through the joint intersection. Use 3 or 4 finish nails and take care to keep the angle correct and prevent the nails from puncturing through the opposite side of the plywood side panel. Add some glue to the first shelf dado and toenail this shelf into place, with the front edge of the shelf flush with the front edge of the cabinet. Repeat for three more shelves before adding the final shelf and the cabinet top into the upper-most rabbet. Complete all the attachments on one side panel before moving to the opposite side. Next, place the opposite cabinet side with the dadoes facing upwards onto the table and apply glue to each of the dadoes and rabbets. Working quickly to prevent the glue from setting, turn the assembly over and insert each of the shelves into the corresponding dadoes on the opposite side of the cabinet. Tap the pieces firmly into place, then toenail all joints. Attach one nailer just beneath the top of the cabinet, perpendicular to the cabinet top but flush with the edges of the rabbet along the cabinet back. This nailer will be used to anchor the cabinet to the wall. Tack the nailer into place with finish nails. Place the second nailer just below the first shelf below the center shelf and tack it into place. Position the divider support brace directly under the front edge of the divider shelf (two shelves down from the cabinet top), and tack it into place. Nail the toe kick into place beneath the cabinet bottom. Flip the entire assembly over to insert the 1/4-inch-thick cabinet back panel into the rabbets along the back of the cabinet. Cross measure the cabinet diagonally to ensure that the unit is square, then nail the back panel into place along all of the rabbeted edges. No glue is required on the rabbets where the back panel fits. Turn the cabinet over again, and cut lengths of screen molding to cover the cut edges of the plywood sides, shelves, top, and bottom. Tack them into place. To install the cabinet, place it against the wall in the area where it should be mounted. Check the unit for plumb with a level, then attach it to the wall studs using 3-inch wood screws through the two nailers in the back of the pantry. As it stands, this pantry cabinet is open-faced. If you wish, you can build a face frame and attach hinges and doors for a more finished look.